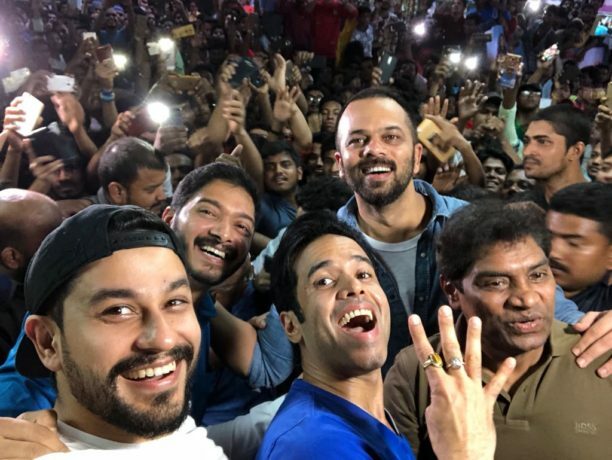 Rohit Shetty’s Golmaal Again starring Ajay Devgn, Parineeti Chopra, Arshad Warsi, Tusshar Kapoor, Shreyas Talpade, Kunal Kemmu and Tabu has managed to garner a lot of love and appreciation from the audience. In fact, Golmaal Again has performed exceptionally well at the box office! The film opened to a whopping amount of Rs. 30.14 CR, making it the biggest box office opening of 2017 after Bahubali 2. With an extended holiday period and a fantastic buzz around it, the film is expected to be a superhit! The cast was so excited about the success they made a surprise stop at Gaiety Galaxy. Thousands of fans were elated to see the team and expressed their love for the franchise.